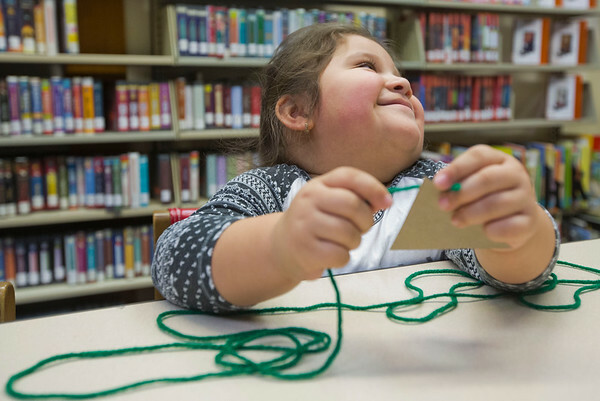 Four-year-old Kayla Rodriguez looks back and smiles while wrapping green colored yarn around a triangle made out of cardboard to create a Christmas tree onWednesday afternoon at the Goshen Public Library. Every day this week from 2 p.m. until 5 p.m. children are invited to the children’s department at the library to create Christmas themed gifts. Tomorrow’s project includes a star ornament and on Friday children will be making another Christmas tree, this time out of music note shapes. The event is free and open the public.